This dimmable, decorative LED from TCP Lighting is energy efficient, consuming only 5 watts of power. 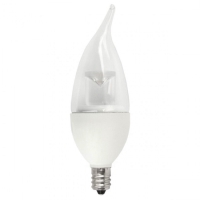 It produces 300 lumens of light, making it an ideal replacement for a 40 watt incandescent bulb. This LED lamp has a color temperature of 2700K, emitting a warm white glow. With a lifetime rating of 25,000 hours, this bulb won't require frequent replacement. The smooth, uniform dimming it provides makes this LED ideal for use in decorative chandeliers, accent lighting, and ceiling fixtures.